well established , mature parkland..
well maintained, lots of feature holes, nothing easy and greens just a bit slick. follow sat nav as road signs might beca distraction. abundant parking and an expansive site, hotel, spa, and golf. marshalls/starter in attendance and a very pleasant half way house. never had the time to experience the cuisine options but it looked ok from the passing glance. its good value if you are not paying a lot to play but the normal green fees asked do not reflect the course, there are a few great holes but generally you could be anywhere on an v average course.its no Woburn. This was my 3rd visit to Foxhills (Bernard Hunt)the last being in 2008, I remembered every hole on the back but nothing on the front, it has improved in its maturity and is a very nice layout the biggest draw back on the day was the greens which had been harrowed. The facilities are fantastic, just glad I didn't have to pay (£95 each), the staff were very friendly, which is unusual for posh clubs. would recommend it but only as long as you can get a deal. The first 12 holes are very spectacular with the various trees adorning their multicoloured coat. 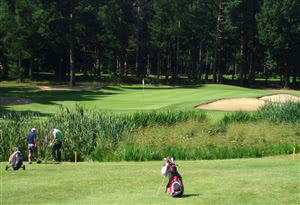 The 18th is a superb finishing hole, where the extremely wide green is shared with the 18th of the Longcross course, just in front of the lovely modern Clubhouse. Quite a challenge on a very enjoyable & mature & fairly long parkland course, with six par 5, eight par 4 & four par 3, (SSS of 73 from white or red tees, yellows a mere 71), some water comes into play occasionally, across or lateral. Great condition on fairways, bunkers full of light fluffy sand, greens slightly woolly but managed some great putts, with many 1 putt only........but do not go in the rough or you have a hard time. Lots of beautiful mature & varied trees, but there is clearance at their base on the tight fairways. The 9th, a short Par 4 , very slight dog leg, uphill, quite narrow but long green well protected by 2 front bunkers. A long walk around & up to the lovely half way hut which serves a great coffee and a fantastic egg & bacon baps which our host (Fiesal B.) & member of this club treated us to. A nice interval before attacking the very tough last 9 holes. As usual a very warm reception in the Pro shop with the latest winter fashion for Men & Ladies.... all the Galvin Green & Roenisch.... The same in the super pleasant Clubhouse : it feels like one is seating in one's own living room: light, airy, modern furniture, plants, fireplace, paintings & photographs on the walls, plenty of Feng Shui there, my sort of place.....I could spend all day just relaxing there. Mr L. and I were the luckily guests of Fiesal B. who is a member of Foxhills, thank you so much for a fabulous day which will be remembered for a very long time. Played the Bernard Hunt....Nice course.....my favourite of the 2 at foxhills and I have played both a lot. Always something be worked on which would annoy me if I wasn't using corporate membership. Theres always a mat or temporary green or noise to annoy you.....and parts of the course are terrible draining.....seem to be boggy all year round! The greens are always good though....true and quite fast. Some great holes....some average ones.....and some that with better care would be great. Only play if you get a deal.